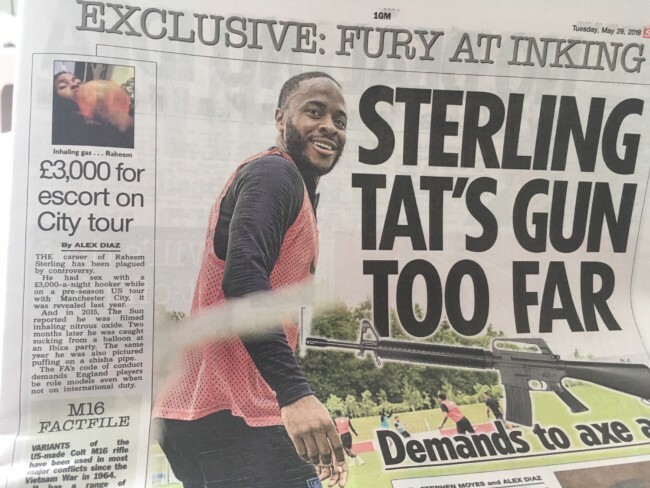 Some news that the FA has a Code of Conduct for England players and that Manchester City and England striker Raheem Sterling might have fallen foul of it on account of his M16 tattoo. 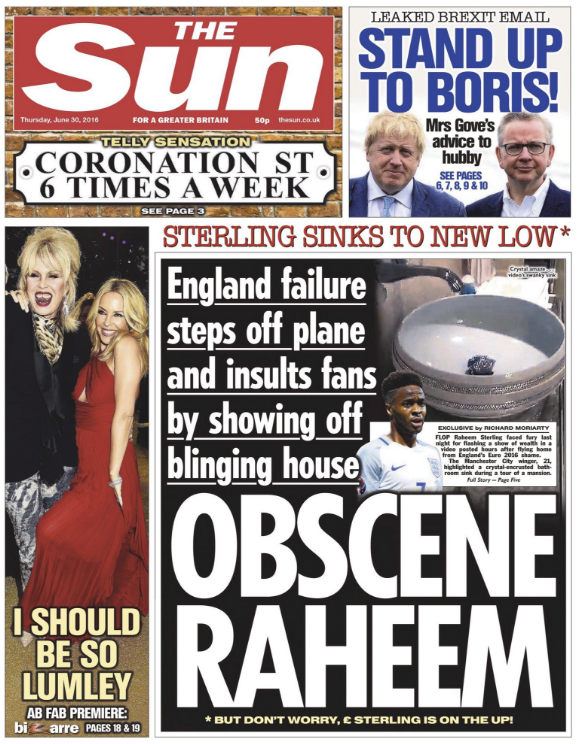 The Sun cites the Code in its front-page news story on Sterling’s tattoo. 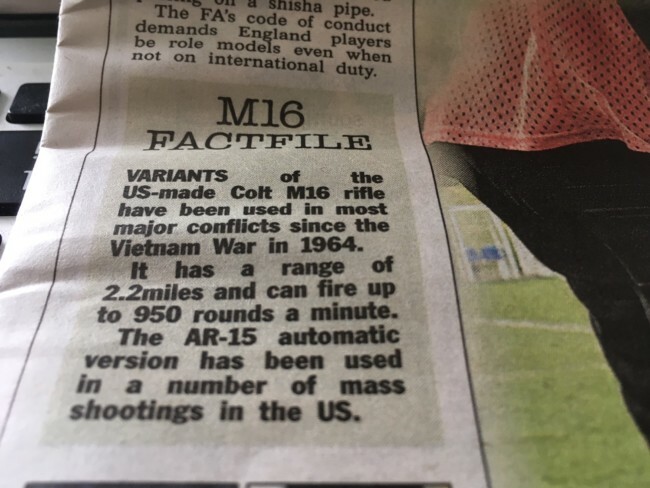 The paper links Sterling’s tat to the Vietnam War. 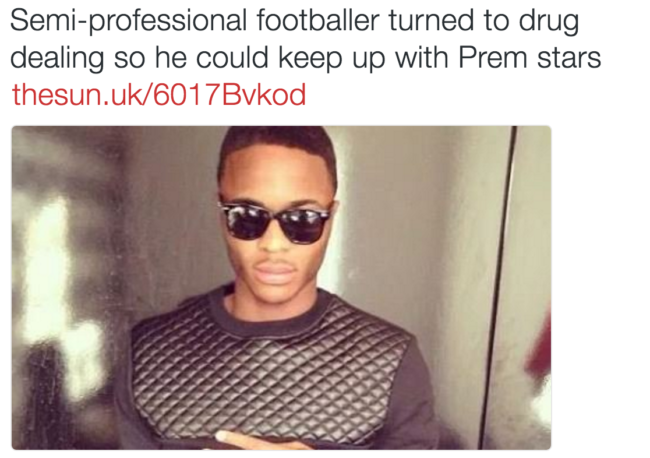 You can read the full Code of Conduct which Sterling has not flouted here. And you can read the list of FA ‘parters’ here, highlights of which are: Mars, Lucozade Sport, Emirates, Budweiser, Carlsberg, Walkers and Coca Cola. All the kind of stuff to get the kids fit, lean and healthy. And there’s Emirates, the airline that sponsors the FA Cup. It’s owned by the government-run Investment Corporation of Dubai. In Dubai, the NYTimes says “homosexuality is subject to the death penalty”. Grab your rainbow laces and run like hell. …it does at least finally address mounting concerns the governing body was being hypocritical and its role as a regulator of gambling was hopelessly compromised by a clear conflict of interest. However, there will still be concerns the football and gambling industries are too closely linked. It will be interesting to see if the clubs follow the FA’s lead. The Premier League itself may not have an official gambling partner (like the FA), but last season 11 Premier League teams were sporting betting company logos on their shirts, and Sky Bet are title sponsors of the Football League. We were gambling such large sums that we knew we couldn’t possibly do it in public. So we gambled in each other’s rooms, behind locked doors. We were like clandestine drinkers, hiding ourselves to get wasted. Except the drug was gambling and there was a sizeable band of us that were addicted. If you’re going to pretend that England players are “role models” to anyone but their nearest and dearest, why focus on a tattoo of a gun and not their employer’s profiteering from gambling, booze, gay bashing and junk food? Young man from working-class background buys house! 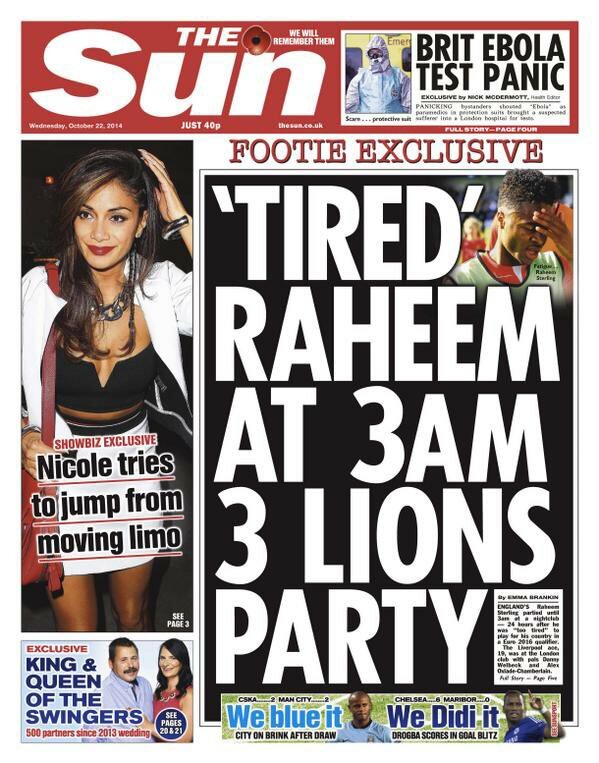 To recap: Raheem Sterling is a professional athlete and England footballer.